The East Asian political scene was changed forever in the 13th century with the failed Mongolian invasion of Japan. The Mongolian empire had reached its height, while the isolated Japanese empire was divided by internal conflicts. When the Mongols sought to conquer Japan and complete its quest for control of all of Asia, it should have been a swift conquest because of the better organization, skill and weaponry of the Mongol force. Yet twice in the span of only a few years, the Mongolian invaders were pushed back not by Japanese soldiers but rather by a devastating natural phenomenon – the Japanese typhoon season – thus named ‘Divine Wind’ for its protection of the Japanese islands. The Mongolian Empire, perhaps the largest in human history, saw its first expansion of territory and power under the leadership of Genghis Khan. Various Mongolian tribes joined together in 1206 and, led by Genghis Khan, conquered vast amounts of land(1). The empire eventually grew to encompass large parts of Russia, the Middle-East, South-East Asia, and East Asia. Of all these lands, Genghis Khan was said to be most concerned with the territories of Eastern Asia, specifically China. China itself had been a wealthy empire, but by the 13th century its power had been diminished by conflicts between different dynasties which had divided up the land(2). Genghis Khan saw an opportunity to take the territory and wealth of China by playing the factions off of each other, eventually making himself emperor of all of China. Genghis Khan would die in 1227 before his dream of conquering China would be realized, but his grandson, Kublai Khan, would continue the work. After taking control of northern China, Kublai Khan moved to Beijing permanently and began the work of fighting for control of southern China, controlled by the Sung dynasty(3). Largely ignored to this point in the grand Mongolian expansion plans was the small island nation of Japan. The Japanese remained mostly isolationist, dealing with their own internal struggles and avoiding confrontation with the growing empire on the mainland. Yet trade relations they continued with the Sung dynasty of southern China forced Kublai Khan to turn his attention to the Japanese(4). Not having complete control over the region, even its trade with outside parties, went against his goal of achieving a vast and connected empire. However, Khan did not begin to approach his relationship with Japan with the assumption it would be another territory to annex. It was actually seen as a potential ally and therefore asset. Starting first with a gesture of friendship, Kublai Khan attempted to establish relations with the emperor of Japan and ask for military assistance in fighting the Sung dynasty. The emperor had no intentions of turning against the Sung dynasty. On the one hand, the Sung had been good trading partners - and Japan was reliant on trade for even basic resources. On the other hand, Khan and his Mongolian forces were seen as foreign invaders - who would probably turn against Japan upon completion of the Sung conquest. When the Japanese refused, the Mongols realized they could not count on the support of the island nation. In fact, they feared Japan would join forces with the Sung dynasty. Though the threat from a Japanese force would be relatively small, it would nonetheless interefere wth the intentions of the Mongol forces in southern China. Therefore, it would be most beneficial to take out the potential threat. The Mongolians prepared to invade. In November of 1274 the first wave of Mongolian ships set out for Japan. They were an impressive force, possibly including 900 ships and 35,000 soldiers (a mix of Mongol, Chinese and Korean)(5). The Mongols landed on the main island of Kyushu, and easily fought the Japanese samurai waiting on the island. At night, however, they returned to the ships and moved out to sea to avoid a surprise attack. Immediately a huge storm gathered offshore. 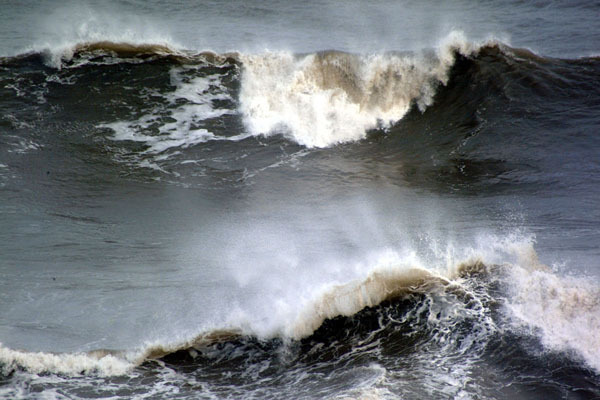 High winds and huge waves arose, along with torrential rains. The Mongolian forces were completely unprepared, as they waited in the water. Their wooden ships were easily broken. Chaos ensued, as it was night and impossible to see. When the storm finally passed, the Mongols surveyed the destruction as complete. Approximately 200 ships were sunk and 13,000 soldiers drowned, thus forcing the Mongolians to retreat(6). The first invasion of Japan failed. Even without the help of the Japanese, Kublai Khan succeeded in conquering the southern Sung dynasty in China by 1279. In retaliation for the humiliating defeat, he turned his attention back to Japan. A second invasion was planned, with many more ships and soldiers divided among two fleets – a first containing 3,500 ships and 100,000 troops, and a second containing 900 ships and 41,000 troops(7). They set sail in May 1281. Again the island of Kyushu was targeted, but the Japanese waited for the attack there and were able to repel the Mongol forces. When the two fleets moved south to take the Japanese island of Takashima, the weather again turned on them. This time the hurricane was so devastating that 4,000 ships were sunk and 100,000 soldiers lost(8). The rest returned to the mainland, and no future invasions of Japan were attempted. Japan had been saved twice by hurricanes that often proved devastating to its own population during the typhoon season. From this miracle salvation the Japanese termed the storm ‘kamikaze’, meaning ‘divine wind’(9). The Mongolian empire had failed twice to conquer a small island nation. The devastation to morale, not just the force capabilities, prevented the Mongolian empire from seeking to expand further. The failure of the invasions proved to have long term effects and historical consequences for both the Japanese and Mongolian empires. Japan maintained its isolationism from the rest of East Asia and prospered. It also never worried about future invasions. For Japan, the Divine Wind instilled a feeling of divine protection. This invincibility fostered nationalism among the Japanese people. A combination of intense nationalism and isolationism had great effects for Japan in the twentieth century. A great deal of development was achieved. 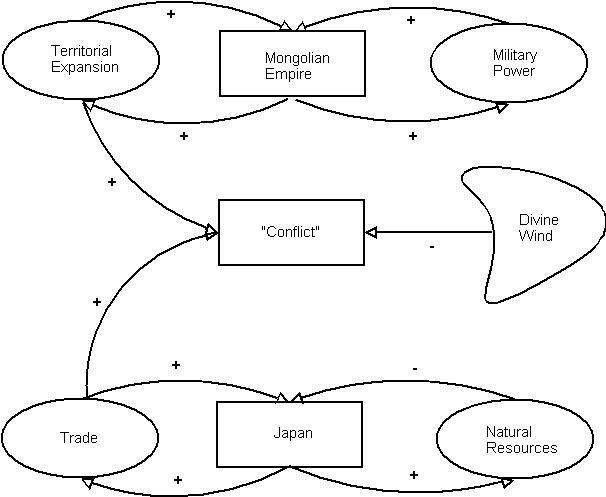 Yet the limits to development encountered by a lack of resources led Japan into conflict with other nations. This conflict reached its height in the form of World War II. For the Mongolian empire, however, the defeat at the hands of the ‘divine wind’ was considered the beginning of its decline. Kublai Khan’s successors were unable to regain the power of the empire and by 1368 – less than 100 years later - it dissolved(10). It went down in history as a great, widespread empire that eventually suffered from overreach and found it impossible to continue expansion. The conflict between the Mongolian empire and Japan began as a territorial one because of the hopes the Mongolians had of taking over the Japanese islands. Contrary to their previous expansion on land, the Mongolians did not target Japan for natural resources. It was of strategic interest as well as political interest. The strategic interest lay in the possibility of completing the Mongolians expansion of the entire Asian continent. It would also have greater access to the Pacific Ocean both for trade purposes and the natural resources it holds. Given the hostile nature of relations between the Mongolian Empire and Japan, trade between the two would not be likely. Though this would be more detrimental for Japan, it would also hurt the economy of southern China (now under Mongolian control). The potential crisis of and economic downturn in that region was a threat to prosperity and stability for the Mongols. The Divine Wind was a natural phenomenon that proved destructive for the Mongolian forces as it has time and again for the Japanese islands. Typhoons are a naturally recurring weather pattern that affects Japan on a yearly basis, with varying degrees of destructiveness. Japan's main rainy season begins in early May in the southern islands like Okinawa, and the stationary rain front responsible for this gradually works its way north until it dissipates in northern Japan in late July(11). In late summer, typhoons develop from tropical depressions generated near the equator, and track from the southwest to the northeast(12). The destruction caused by typhoons can be measured not only in human terms like loss of life and property damage but also its effects on the natural world. Rough seas, strong winds and heavy rains are typical of Pacific typhoons(13). These can upset the balance of living creatures in the sea, often displacing them with especially large waves. Coral reef structures, which exist along the coasts of Japan though not to the extent of other Asian islands, can be damaged in rough seas. Plant and animal life residing along the shoreline can also be adversely affected when flooding or particularly damaging storms occur(14). Certian species may not be able to survive such a shock. On the other hand, it is a part of the natural process. After the destruction, new plant and animal life can grow back. This regeneration is essential. 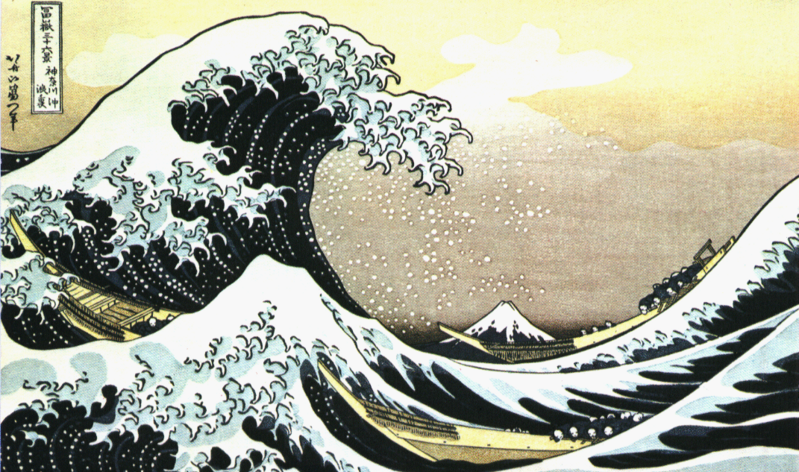 The legacy of the Divine Wind may have contributed to modern-day environmental problems for Japan. With the failed invasion by the Mongolians, Japan asserted its isolationist policy. While this policy was politically advantageous, it also highlighted the inherent resource scarcity an island nation faces. With a growing population and a finite amount of land on which to develop, Japan soon found itself in need of more resources than were available to it. Especially to acquire materials for technological advancement and the ever-important energy source, oil, Japan had to rely on trade with foreign countries or seek to expand its territorial reach. Another modern-day environmental problem that is related to Japan’s climate is global warming. Typhoon seasons have grown increasingly severe in recent years, with more damage than ever. Many have argued that global warming may be responsible for climate change, which includes this trend toward bigger and stronger typhoons(15). Japan no doubt adds to the growth of global warming from its industrial production and high car emission rates, polluting the land, sea and air(16). Ozone depletion and the gradual warming of the sea may be responsible for fostering more typhoons from the equatorial regions. The Japanese islands are situated in the northern Pacific Ocean, along the Eastern coast of Asia. It is a temperate climate with the four traditional seasons, though the typhoon or rainy season is often counted as a separate season. Japan is an archipelago consisting of over 3,000 islands in a long line from North to South. Thus climates vary within the country as the North tends to be much colder and the South can be considered sub-tropical. The ocean habitat is significant when studying Japan because it is an island and has very close ties to the water. The ocean acts as a natural border, which greatly helped when Japan was following a policy of isolationism. Additionally the ocean acts as a resource for Japan. Finally the ocean can cause harm to the human population when storms like typhoons are formed. The type of conflict in this case was war, brought about by the competing interests of the Mongolian Empire and Japan. The Mongolian Empire sought to expand its territorial assets, while Japan was concerned with defending itself from a foreign invader. The difference in state interests led to a military confrontation in which the invading Mongolian army clearly had an edge in tactics and weaponry. The Japanese were less prepared and not well organized. They were skilled only in Samuari tactics, which were beneficial for hand-to-hand combat but provided little defense from Mongolian artillery. Furthermore the Mongolian army had the element of surprise in the first invasion, as the Japanese were not warned of the oncoming invasion until the barrier islands had already fallen. However, the Japanese adapted quickly to the circumstances presented and held their position at Hakata Bay better than the Mongols had anticipated(17). The final blow of course was dealt by the devastating typhoon which significantly depleted the Mongolian force. In the second invasion, the Mongolian force was significantly larger, comprised of not only Mongols but also recently conquered Korean and Chinese soldiers. They continued to have more weapons than the Japanese force. Yet within the Mongolian force the morale was lower than in the first invasion, owing to the nature of servitude the mercenaries from Korea and China experienced. These mercenaries were drafted by Kublai Khan after their dynasties fell to the Mongolian Empire. The soldiers from Korea and China felt little loyalty to their new ruler. At the same time, Khan had little regard for the new mercenaries. He specifically sent them to invade Japan because their loss would not be as important to him as his own Mongolian forces. In a way, they were being sent to their death. This fact was well known to the Chinese and Koreans. They therefore felt little morale, and were not concerned with fighting to the best of their ability(18). On the Japanese front, soldiers were better prepared for the second invasion. Upon learning of the fall of the Chinese Sung dynasty to the Mongolians, the Japanese knew they would soon be a target again. More samurai were sent to defend barrier islands, and protective fortresses were built at Hakata Bay to provide some resistance to the Mongols. Additionally, the Japanese felt more unified and had higher morale in anticipation of the second invasion. They had begun to feel more nationalistic and took pride in fighting for their empire(19). After being saved from the first invasion, they had greater hopes for defending their country a second time. Even civilians felt involved in preparing for the attack, as stories are told of prayers and offerings being made in the name of victory over the invaders. This level of morale contrasted sharply with the Mongolians - even though the Mongolian forces were better prepared to fight a war. The level of conflict between two states, Mongolia and Japan, was high during the first attempted invasion in 1274 and grew even higher during the second invasion in 1281. (See Tables 3-1 and 3-2, below). It is also important to compare the levels of weaponry each side had at its disposal. (See Table 3-3, below). The Mongolians had the upper hand, with a higher level of technology in its weapons as well as a better skilled force to use them(22). Their weaponry included not only well-made cross bows and slings, but also gun powder and guns borrowed from the Chinese. Mongol warriors were well protected from armor - comprised of leather and metal. The structure of the Mongolian army was also highly organized, disciplined and trained. They were divided into units of 10, 100, and 1,000. However, their tactics had served them best in land wars, not sea invasions. Their cavalry would be of little help until they were actually on land in Japan. The Japanese force, on the other hand, was comprised of Samurai trained in close-range combat. Despite this, however, they adapted quickly to the Mongol threat and built strong fortifications. Given the historical nature of the conflict, numbers of fatalities are not always available or have been treated as estimates. Nevertheless the data appears the same in various sources. Given the historical estimates, it is approximated that the total of casualties from the two invasions reached over 113,000 as results of the destruction of the Mongolian force by the Divine Wind(23). Casualties directly related to human fighting are harder to estimate, but could have reached several thousand Samuari on the Japanese side and any number of deaths on the Mongolian side. The First Invasion presented a high level of civilian casualties on the Japanese side because as the barrier islands were overtaken, entire Japanese populations were destroyed(24). The Mongol forces moved stealthily and quickly through those first islands. They killed everyone and destroyed every building they encountered. They were not known for sparing women and children during a conflict. Additionally many unprepared samurai were killed on these islands and at Hakata Bay. The Mongolian force certainly faced some casualties when they were unsuccessful at taking Hakata Bay in the first days of fighting; however, the bulk of their casualties were experienced from the ‘Divine Wind’. The Second Invasion presented fewer civilian casualties, as mostly Samurai were killed on the barrier islands and at Hakata Bay. The Japanese force had a larger upper hand at Hakata initially because they managed to build fortifications and keep the Mongolian force from reaching land(25). Therefore a moderate amount of Mongolian casualties were incurred from the early stages of fighting. It is important to note that as the rest of the Mongolian fleet arrived from China, the Japanese defenses would not have held much longer and the Samurai would have faced greater casualty levels. Yet as it happened, the ‘Divine Wind’ again interceded and destroyed the Mongolian force. (See Tables 3-4, 3-5). Mongolian n/a 100,000 [by Divine Wind] 3,000 ships lost [by Divine Wind]. Additionally 3,000 Mongols died of disease. The links between environment and conflict in this case are directly related. The invasion of Japan by the Mongolian Empire can be seen as a territorial dispute. The Mongolian Empire sought to extend its reach as much as possible, which led them to eventually view the Japanese islands as a strategic interest. The population already living there would of course oppose the invasion of a foreign force. The environmental-conflict link can also be seen as indirectly related to natural resources. Japan, an island nation, needed to trade for access to resources. It had established a good working relationship with costal zones of China and Korea. However, the Mongolians would not accept this relationship and effectively cut off trading between Japan and the other regions. The environment can also be seen as a direct link to conflict through the use of the weather as a weapon of war. Though the Japanese did not control directly the typhoon that hit the Mongolian force, the typhoon certainly did act to their advantage. The Divine Wind caused the greatest amount of damage and destruction in this case. Without it, it is likely the Mongolians would have been able to easily take control of Japan. This conflict occurred on a regional level. 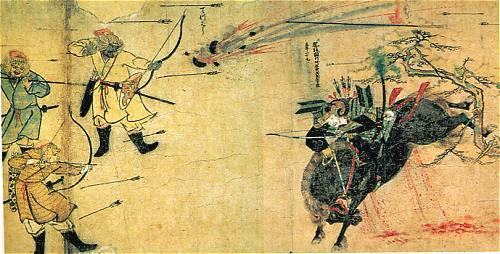 The conflict largely occurred between Japan and the Mongolian empire. However, given the vast expanse of the Mongolian empire, the region involved in the conflict was quite large. Also the Mongolians had taken land that belonged to China and Korea. Citizens of those areas were forced, largely against their will, to join the Mongolian forces in invading Japan (which had once been their good trading partner). From the Mongolian Perspective, this conflict was a complete loss. On two separate occasions, the Mongolian forces were unable to invade a small island nation. Such a stunning loss greatly affected Mongolian aspirations of expanding to any more territory. Instead, the Mongolian Empire began to be slowly torn apart by internal conflicts, and a lack of clear leadership. Not much later, the Mongolian Empire collapsed. Sansom, George Bailey, Sir. A History of Japan. Stanford, Calif., Stanford University Press, 1958-63. Country Flags Courtesy CIA World Factbook. Map Courtesy University of Texas at Austin.